This is a sample of organic sock roving from Extreme Spinning. I ordered a larger supply of this wool in a different color and this little fluff came along as an extra. The color is "Strawberries and Cream" and it's a really pretty red with shots of pale pink. I spun it up so I could get a feel for the fiber before I tackled the 4 oz roving. This was really different wool to work with. 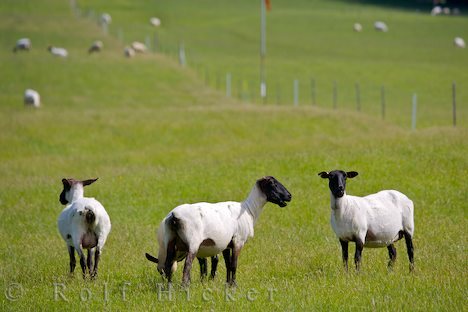 It's from Suffolk/Hampshire cross sheep, which are actually meat breeds. The wool is a down wool and it's quite different from fine wool breeds like Merino, Rambouillet, or Corriedale or longwool breeds like Blue-faced Leicester. Instead of having fibers that align in a tight wavy crimp or long loose waves, each fiber has a tight spiral crimp that doesn't align with neighboring fibers. The staples are short and the roving looks and feels like a soft, spongy brillo pad, but in a nice way. Even looking at the photo, it's easy to see the fibers are all over the place and not smooth and silky. Spinning was interesting because it didn't draft in a smooth triangle. Even while spinning worsted, the fibers felt crinkly and were aligned in all different directions. It didn't twist tightly because the spiral crimp keeps the singles open. I Navajo plied the singles and made about 10 yards of tight, springy yarn. It feels softer after a soak in Eucalan, but it's still not soft and silky. It's squishy and spongy and should make good, hard-wearing socks because it's not a readily feltable wool. Fine wools felt if you look at them sideways, so this is definitely a plus. My plan is to spin the big 4oz (in a lovely Princess Bride inspired colorway) with the same Navajo ply method so I can knit socks. My feet get cold and I usually wear a pair of regular socks with heavier wool over the top. Although my Malabrigo socks are heavenly, they are felting, even on my hardwood floors. I walk delicately with them on and would never put them in a shoe. I've been reading In Sheep's Clothing as I shop for fiber online and whenever I plan to spin something new. Although Suffolk/Hampshire wool isn't going to make a nice hat, it's perfect for socks that will be pretty and won't worry me whenever I put them on. There's a reason there is more than one breed of sheep and I think spinning the different wools is part of what makes spinning so exciting. I also have a soft spot in my heart for Suffolks since they are such pretty sheep. Funny that I came across your post. I bought 3 different colors of this roving from the same seller. I spun about 10 yards of it and don't like it. I am giving away the one batch I started and I guess I'll try to sell the other 2 on ebay because I don't imagine the seller would want to buy them back. I didn't find it a pleasure to spin - it's far too rough. And as you say, it's very crimpy. Almost crinkly like shredded plastic. And while the socks would probably wear like iron, my feet are almost as sensitive as my hands and I don't think I could wear them. I love the seller's colorways - just don't like that roving.